This is the new PDF version of Winsted's 2017-2018 Catalog. This is a Power Point Presentation showing the Winsted products for complete control room design. Sight-Line, Winsted's next generation control room console, builds upon the success of our popular Slim-Line command console. 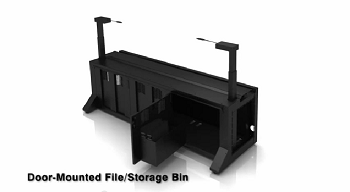 Sight-Line's modular design allows for flexibility and expandability in control room console configurations to fit any space requirement, user need, or budget. Sight lines and viewing angles are critical in today's LCD driven command and control room environments. To address this issue, Sight-Line command consoles feature an integrated Versa-Trak monitor array system, which allows the ultimate in adjustability. The Versa-Track system allows users to optimize and easily modify sight lines and viewing angles based on personal needs. Whether you need a single workstation or a complete control room, Sight-Line command consoles are perfect for all installations. 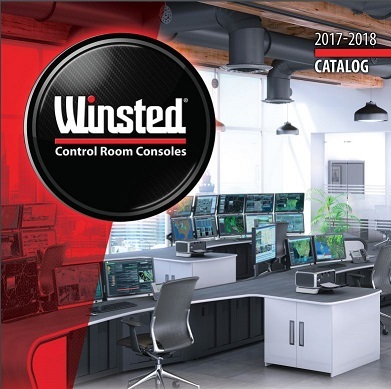 This is a brochure desribing the new Winsted E-SOC Control Station consoles. 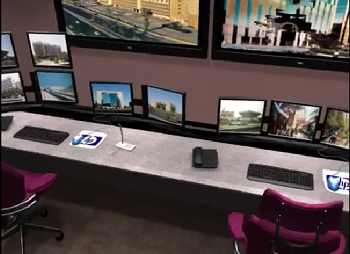 The followin collection of video animations show various Winsted console systems, their construction, and virtual tours of the systems in use. All are from Winsted's Youtube group "winstedcorp". Click the imagews below for individual vides. Insight Control Room Consoles feature a compact profile designed for a high performance world. Insight's overall depth of 32.5" saves valuable space and maximizes command center and control room functionality. 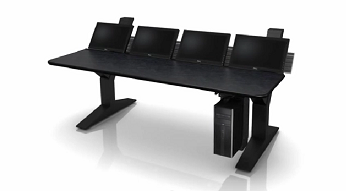 Our engineers reduced the overall depth of the chase and work surface on the popular Sight-Line console furniture to create a compact solution with an efficient footprint that meets ergonomic standards, and provides ample desktop workspace. If you are challenged for space, but want a fully functional console packed with features, then Insight is the answer. Ascend: Sit/Stand Console offers three programmable height settings for ultimate versatility and optimum comfort in any control room setting. This completely redesigned sit/stand console includes electric-lift legs, which enable operators to quickly and easily adjust the work surface height from 28-1/2" to 44-1/2" with the push of a button. 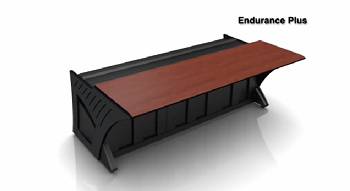 Two-, three- and four-leg systems are available with load capacities of 300, 450 and 600 lbs. respectively. 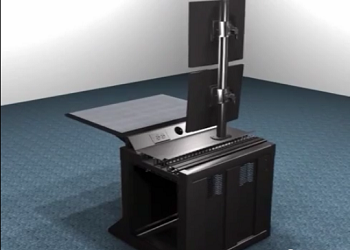 Winsted's E-SOC Control Station is an incredibly versatile and ergonomic command center. As a hybrid of our award-winning Prestige control console and the Encompass II workstation, E-SOC offers ultimate adjustability and personalization. The E-SOC Control Station is one of the newer additions to Winsted's product line, but it is fully equipped with a variety of features. The Versa-Trak monitor mounting system allows operators to easily tilt and pivot monitors to improve viewing angles. In addition, lift-off access panels, integrated cable management and a hinged corner make E-SOC a practical technical furniture solution for any control room. Winsted's EnVision Control Room Console is a sleek, modular design available in single, double or triple tier configurations. The ergonomic design of EnVision command consoles provides users with the ability to expand and adapt to any sized control room environment. 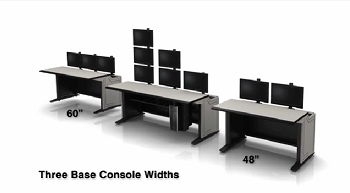 With three base console widths (42", 60" and 84), unlimited corner configurations and no predefined angles, EnVision can provide a technical furniture solution to meet any and all needs. To top your workstation off, choose from multiple work surface options that will make your control room console as sleek in appearance as it is functional. 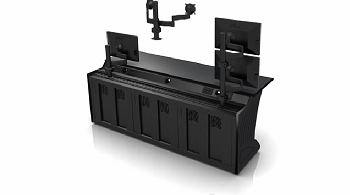 Sight-Line consoles are ergonomic, adaptable, and modular to provide users with the flexibility and expandability to fit any control room environment. Sight-Line consoles feature the Versa-Trak monitor mounting system, which offers the ultimate in adjustability. Viewing angles and monitor sight lines are easily optimized based on personal needs. Sight-Line is a beautiful console that boasts a feature set second to none. 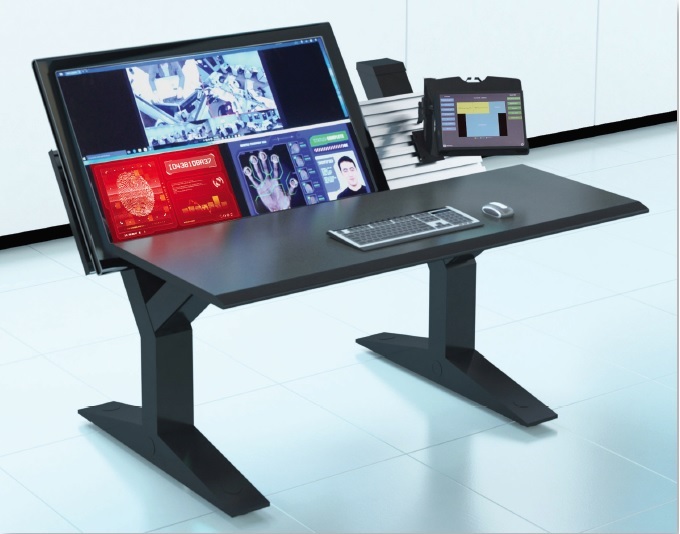 Winsted's Sight-Line Command Consoles builds itself giving user's flexibility in any command and control room environment while producing an ergonomic work environment suitable for any application.